Global market sizes for nanocoatings and coatings are expected to be $14.3 billion and $123 billion, respectively, by the year 2019. Coatings can be classified according to their applications or method of preparation or type of property imparted to the product. They can be either solvent based or water based and may be comprised of polymers or inorganic materials. Nanocoatings with thicknesses less than 100 nm can offer superior performance properties compared with conventional coatings. Nanotuff was one of the first commercial nanocoatings, it contained nanosized particles suspended in an epoxy matrix. Coatings can have specific purposes such as corrosion resistance, antiabrasive resistance, scratch resistance, chemical resistance, and stain resistance to the objects they are applied on. This book contains some new theory in the areas of solubility parameter estimates using isentropic volume expansivity, compressibility, and surface tension effects during coating flows. 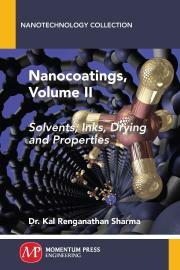 This volume contains chapters on methods, solvents, drying and inks, and properties. Patents from leading companies such as Xerox, IBM, Intel, BASF, PPG, Boeing, Valspar, Toyota, Goodyear, Gaze Nanotech, Bell Helicopter, Procter & Gamble, and General Electric on nanocoatings are discussed in the book. Dr. Kal Renganathan Sharma , PE, received his BTech in chemical engineering from Indian Institute of Technology, Chennai, India, in 1985 and MS and PhD degrees in chemical engineering from West Virginia University, Morgantown, WV, in 1987 and 1990, respectively. He is the author of 13 books, 548 conference papers, 46 journal articles, 7 book chapters, 3 review articles, and 113 other presentations.